Instead of tracing code at the instruction level, Process Stalker traces code at a higher level by setting and monitoring breakpoints at the head of every basic block. Since every instruction within a block is guaranteed to be executed once the block is reached, there is no need to trace any further into the block. 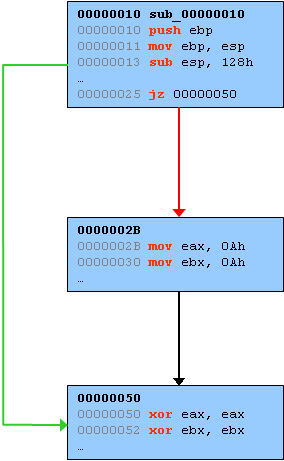 Improving code trace speed using the basic block method is not a novel idea, [http://www.sabre-security.com/]SABRE Securities[/url] commercial product Bin Navi utilizies the same technique. Even more creative mechanisms for improving trace speed have been developed as well: See Matt Conover's project list at http://www.cybertech.net/~sh0ksh0k/projects/ as well as the recent blog entry and tool announce from McAfee at UMSS: Efficient Single Stepping on Win32. There are downfalls to all of these shortcuts howevever. The creative ones can get quite complicated and the basic block method requires that the target binary is pre-analyzed to determine the location of all the basic blocks. To successfully enumerate basic blocks you must first correctly differentiate between code and data within an individual binary. This is harder said then done which is why both Process Stalker and Bin Navi really on IDA Pro's analysis. This is a drag because not only does it introduce significant steps to setup the trace but IDA can make mistakes that can botch the entire trace. An improved version of basic block tracing is desired. and Interrupts" for more information about the BTF flag. # re-raise the single step flag on every block. # ensure every new thread starts in single step mode. I'll be adding MSR routines to PyDbg in a future release and will also release a new version of Process Stalker that does not require any pre-analysis to accomplish its code tracing... When I find the time to do all that I may expand this blog entry with further details and examples into a full blown article. Caveat Emptor: It appears that you can kill your CPU if you carelessly fool around with MSRs. So there, I said it, be warned. Great stuff. Thanks for the pointer. I have been working on path finding and buffer mutation stuff and this information really helped. I can't believe that I missed to spot this information in IA32 manual. First, thanks for the pointer. Second, when you say "kill your CPU", are you speaking of a temporary or permanent death? In other words, are you killing it until the next power cycle or actually bricking your PC?! Here is code which will do it in Linux. Warning: I ripped this out of some other code I have so no promises on how well it works. Your msr "device" may be at a different location, edit those lines accordingly. You need the msr kernel module installed and the program must be run as root. Enjoy. You can do this with other events too by using a clever little trick with the performance monitoring buffers. There is a bit in one of the MSR's that specifies what action to take when a trace buffer gets full. If you tell it to generate an interrupt, every time your trace buffer gets full, your code will get control. However, you can set the trace buffer to any size you want, including a size too small to fit a single event. This means that for every event listed in Appendix A of Volume 3, you can effectively break on, just like a branch trace. Just a quick note. A friend of mine wrote and reminded me to mention that these MSR games do not work in VMWare (unfortunately). otto: My bad ;-) Copy pasted the wrong line, fixed now. is the tracer_msr_branch.py link is forbidden on purpose? stam321: Nope, it shouldn't be forbidden. Fixed now, thanks for pointing it out. I've tried branch tracing using msr with p6 familiy cpu dual core and couldnt get it to work. after p4(0x1D9) and bit 1 controls the BTF. I tried many things and it doesnt work. any ideas? I m trying to write MSR register with following function but NtSystemDebugControl returns 0xc0000022(access denied). Any ideas on what might be the possible cause? Did you set debug privs? Did you try this trick? process_handle = process handle of debugee. Very nice work. This solution does enable branch tracing for every process being single stepped at the same time, is that correct? After I read this some time ago, I've been wanting to dust off an old project that might make for a handy tool if I can get it to work right. I setup things as described here (I'm using C/C++ in WinXP SP2) and got it to "single step on branches". But I saw strange things, at least not what I was expecting. The exception/EIP address seemed to happen before or after a branch sort of random. After a few hours of reading I found we are missing a few things here. First I recommend looking at the AMD manuals; they are a little less dry and easier to read then the Intel ones. Grab them here, and or search the site for publication "24593". jumps, interrupts, and exceptions. This can allow a debugger to narrow a problem search to a specific section of code before enabling single stepping of all instructions." Most of the MSR/debug stuff I found in volume 2. The MSR/debug info we are interested in starts on page 321, and 420. FYI the MSR debug registers, very similar, and even compliment the "legacy" DRx registers. So don't fear them. I seriously doubt you can "..burn out your CPU". At most I could see this if one messed with the wrong registers like the CPU clock/multiplier registers that some processors have (that you can access via the MSR). 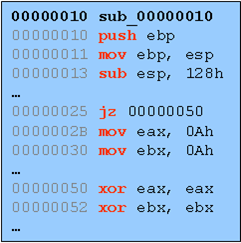 Page 322, 420, vol 2, defines the DebugCtlMSR (MSR 0x1D9) control bits. In addition to the BTF (bit 1) already described, also set the LBR (bit 0). This will turn on the recording of the last BTF exception. Page 323, 420, vol 2, defines the recording registers (0x1DB to 0x1DE). You will see two interesting registers "LastBranchFromIP" (0x1DB) and "LastBranchToIP" (0x1DC). We already get the "to" from "ExceptionInfo->ExceptionRecord->ExceptionAddress" (or ExceptionInfo->ContextRecord->Eip), 0x1DB tell us the address where the branch came from, and in a virtual address we can just read in the low 32bits (ignore the high 32bits)! So now it should make sense, when the "EXCEPTION_SINGLE_STEP" happens, read the recording register 0x1DB to get the source/from address. For me, I just want to handle the calls. So for every exception I have to grab the source address and do sort of a mini-disassemble on the first few opcode bytes to determine if it was a CALL instruction or not. Fortunately, in most normal 32bit applications the majority of the calls will be a single byte 'E8' (5 byte relative 32bit call) test. So far my tests have only been a single threaded (and single core) test application. I look at this and wonder if there will be thread problems. There is just one recorder register on the CPU, not one per thread. Hopefully the way it and the windows SEH works, it will all be synchronous and not miss a step. If there are such problems, one might have to make some sort of kernel driver that add the missing support in the SEH. Seems this should be in the context structure, and read just like on can read the DRx registers..
And more, Intel processors have a stack of up to 16 stores for the recorder depending on the processor. Looks like one will have a make a little system taking the particular processor into account. And still not uncertain this doesn't require a modification to the kernel SEH flow. Maybe one thread easy enough in user mode but what happens to the recording register(s) when you got multiple threads firing off the branch exception around the same instant? I see this ideally as ending up in the Win32 context structure. Seems to me a "ExceptionInfo->ContextRecord->BranchFrom" would be ideal..
Edit: But, not using the MSR/BTF thing yet. Got branch tracing working very well using a KMD and doing a hardware hook on int1. So well that it can trace complex processes (with many threads) in real time. Quite a slow down, but workable. More R&D and eventually demo to follow..
a bit long reading, so in shortcut: for enabling branches in win x64, just set some bits in debug 7 register (DR7.LE, DR7.GE). That's all ! Simple, huh? Unbelievable and funny? No, that way really works under current versions of x64 windows. I used a driver my self for a direct in1 handler. It works well because it eliminates a lot of overhead. I was able to use the last branch record stack too, but have you been able to get the "DS store" going under windows? It takes a lot of setup and apparently can only work with several kernel OS hacks (like VTune does). There is next to no documentation (that I can find) setting the DS buffer to work on windows.. It's been some time now, but I incidentally found the problem with doing this BT ("branch tracing") in R3 some time ago. I just didn't look deep enough. Although really to do this in real time you probably want to use a R0 driver anyhow. Without a driver you will be going through all the hoops of the OS exception handling, down from it's IPC messages into the R3 handling of your process, etc. Anyhow the problem is the same faced with doing "page guard" or similar memory exception tracing/hooking. Every time an exception fires it's passed down from kernel to user code in ntdll.dll and on through kernel32.dll. If you happen to branch trace into some of these places the flow will spin around in an obvious feedback loop and crash once stack space is exhausted. With at least memory exceptions I found I could bypass the problem using a ntdll.dll hook on "KiUserExceptionDispatcher" but haven't tried with BT'ing yet. Maybe with such a hook, and, or with some additional logic in the BT handler for these conditions it will work fine in R3. Another possibility is cleverly using hardware break points on entry and exit points to perhaps pause and continue the BT'ing at strategic points. But then it would limit things to four threads and use this resource..
Is call opcode a branch instruction ?? My point is with setting the msr branch flag can we stop at step_in of a call ? ?